Lacy J. Dalton (born Jill Lynne Byrem on October 13, 1946 in Bloomsburg, Pennsylvania), is an American country singer and songwriter with a career that has spanned many decades and touched the hearts of millions of music fans. In March 2017 Lacy J Dalton was inducted into the North American Country Music Association International Hall of Fame, and in 2018 she was nominated for a Lifetime Achievement Award. She is one of the most instantly recognizable voices in music – the woman People Magazine called “Country’s Bonnie Raitt.” From the first time Lacy J Dalton caught the public’s ear, that soulful delivery, full of texture and grit, has been a mainstay of Country Music. 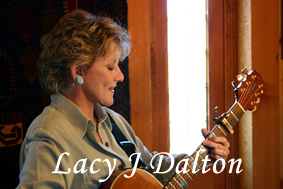 When you sit to listen to a Lacy J Dalton album, you find yourself pulled in by the very power and heart of this vocalist, because she’s not merely performing a ten-song set, she’s bringing each and every tune to life. It’s as if they were all written especially for her. Prior to signing with Harbor Records in 1978 as Jill Croston, she like many before her, held many jobs to survive and support her family. As a truck stop waitress and singer, she would wait tables and then jump on stage to sing a few songs. Her hard work and dedication paid off in 1979 when she was awarded the Academy of Country Music’s Top New Female Vocalist of the Year. Then in 1980, Lacy J Dalton was signed by Columbia Records and quickly rose to national prominence with Crazy Blue Eyes, which she wrote with her longest friend, Mary McFadden, and which raced to #7 on the Billboard Country Charts. Lacy’s success was powered not just by the artist’s recordings, but by a stage show that truly electrified audiences. She quickly became one of the few women who could successfully open a show for the likes of Hank Williams, Jr., Willie Nelson, Merle Haggard or Charlie Daniels. Not only could she do it, but she left audiences across the country hollering for more. Her hit records are legendary million-airplay cuts: Hard Times, Crazy Blue Eyes, Hillbilly Girl with the Blues, Takin’ It Easy, Everybody Makes Mistakes, the worldwide hit Black Coffee and her signature song 16th Avenue, the Anthem for Nashville songwriters that was voted one of Country’s Top 100 Songs ever by Billboard Magazine. In addition to her Top New Female Vocalist award, she also brought home numerous Grammy nominations and 3 prestigious, back to back (1979, 1980, 1981) Bay Area Music Awards for Best Country-Folk Recordings. Lacy appeared on those shows with the likes of Neil Young, The Grateful Dead, Grace Slick and the Jefferson Airplane. Following a successful career in country music, Lacy decided to draw on all her musical experiences including country, rock and folk, and cross over into the Americana genre. This blend of musical styles allows her to express herself in a way that demonstrates all the facets of who she is as a singer/songwriter. She became an independent artist and formed her own label called Song Dog Records. Under this label, she has released three albums to date. The first was Wild Horse Crossing in 1999, followed by the Last Wild Place Anthology which went #1 on the World Independent Chart, and a year later went #1 on the American Western Music Chart. Then Allison Eastwood, Clint Eastwood's daughter, used the hit song Slip Away from the Anthology CD on the sound track of her independent film, Don't Tell. In 2010 Lacy also released a tribute to Hank Williams Sr. entitled Here's To Hank. Today, Lacy continues to record new music and perform live shows whenever possible. She tours mainly west of the Mississippi and loves small boutique venues and old theaters with great sound quality and warm, receptive audiences she can really connect with. She recently recorded some electrifying new music for an EP that is scheduled to be available in late 2018. When hearing the signature song Scarecrow, her good friend Reverend Barbara Ann Fletcher remarked “that song makes you a whole new you, and it makes me a whole new me.” And that’s exactly the response Lacy was hoping for. In addition to her musical career, Lacy has been involved in various service projects through several charitable organizations – namely, the Let ‘em Run Foundation, William James Associates Arts in Corrections, and Rotary International. In 1999, Lacy co-founded the Let ‘em Run Foundation which received its 501(c)3 designation from the IRS in 2004. The Let 'em Run Foundation is dedicated to preserving, recovering, and providing sanctuary and homes for America's wild horses and burros who have no voice. Let ‘em Run’s mission is to serve as an educational, fund-raising and public relations entity, through its own efforts and in assisting similar non-profit organizations, to promote the appropriate and compassionate management of the wild horse, estray horse, and mustang population of Nevada and other species of endangered or mistreated animals. Since 2015, Lacy has been working with the William James Arts in Corrections program at High Desert State Prison in Susanville, California. Her work there has been focused on teaching basic song writing skills and techniques to level 4 inmates. Through her classes, a select group of inmates get the opportunity to learn the basic principles of song writing which they then use to develop songs and lyrics, both individually and as a group. The class culminates with the inmates recording those musical compositions and giving a live performance to an audience of prison and non-prison personnel. Finally, Lacy is an honorary member of the Rotary Club of Reno, and a Paul Harris Fellow. Lacy has written two songs for Rotary, which she then recorded on a CD to be used as a fundraising opportunity for the Reno club. Lacy also performed at the Rotary International Convention in New Orleans in 2011, and has been a key note speaker and headline performer at several club meetings and district conferences.